Barcelona: Thousands of people demonstrating both for and against Catalan independence shut down parts of central Barcelona on Saturday, two days before the anniversary of a vote on secession last year that polarised the wealthy Spanish region. Over several hours pro-independence groups chanting “Neither forgetting nor forgiveness” faced off with unionist protesters chanting “Long live Spain” ahead of a weekend of further demonstrations planned to mark last year’s vote. 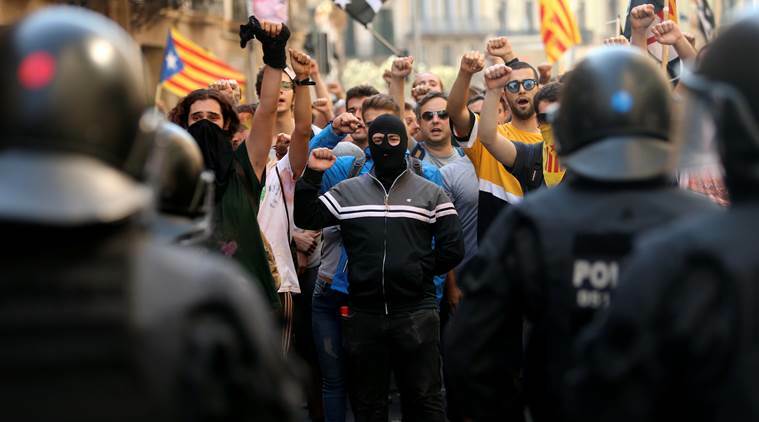 Joan Puig, a 42-year-old mechanic, recording the protest in support of the police on his phone, said that the conflict had been stoked by politicians on both sides. “It’s getting more and more tense,” he said.